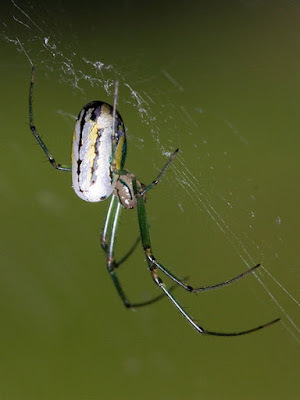 Female orchard spider Leucauge venusta, copyright Kaldari. The Tetragnathidae are a cosmopolitan family of orb-weaving spiders. Many, but not all, species have characteristically long, well-developed chelicerae. Characters (from Jocqué & Dippenaar-Schoeman 2007): Small to very large; eight eyes present; legs with three tarsal claws; ecribellate; entelegyne or secondarily haplogyne; male genitalia comparatively simple, with large paracymbium and often several cymbial processes, conductor and embolus coiled apically; median apophysis absent. [HD90] Hormiga, G., & H. G. Döbel. 1990. A new Glenognatha (Araneae, Tetragnathidae) from New Jersey, with redescriptions of G. centralis and G. minuta. Journal of Arachnology 18: 195–204.